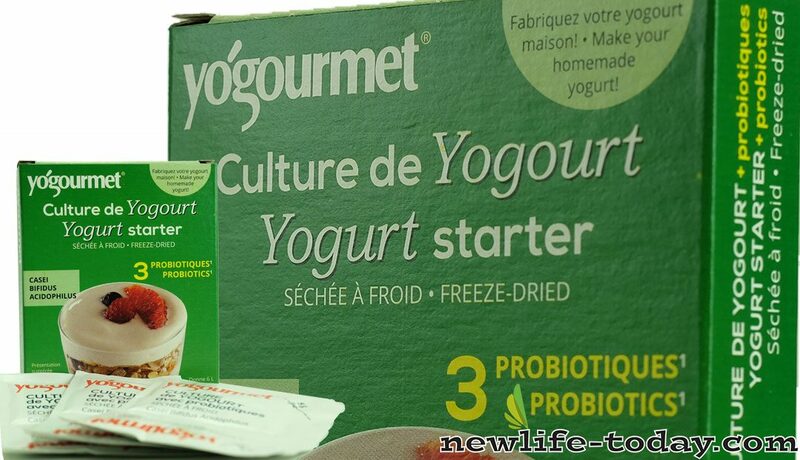 Buy this Yoghurt Starter at RM 34.40 (20% off retail) when you become a member of NewLife International. Home made yoghurt with Yogourmet… it’s easy, natural and delicious. May be used with any make of appliance, according to instructions. See inside the box the complete instruction. CREME BULGARE: Follow same instructions as for yoghurt, using cream instead of milk. The yoghurt used to determine the nutrition value was made with 2% milk. This product is manufactured in a facility that manipulates product that contains wheat, soy, eggs, milk and fish (including shrimps). Lactic bacteria (Lactobacillus Bulgaricus, Streptococcus thermophiles, L acidophilus). You may not know this but 80% of your immune system is located in your digestive system. That’s right, your digestive tract contains more than 400 types of “friendly” bacteria that help you stay in the pink of health. Yoghurt is packed with probiotics, and these friendly troopers reduce the growth of harmful bacteria and promote a healthy digestive system. Aside from that, yoghurt is also an incredible health booster. Its calcium is great for your bones, the protein helps build muscles and it can help you lose weight, soothe your tummy and even fend off a cold. Good-for-you probiotics – Live-active cultures in yoghurt can protect your digestive tract by fighting off harmful micro-organisms that can cause intestinal infections and colon cancer. Acidophilus, a powerful friendly Lacto bacteria acts as an anti-carcinogen by promoting the growth of healthy bacteria in the colon. This reduces the conversion of bile into harmful bile acids. Loaded with vitamins – A single serving of yoghurt is a rich source of zinc, iodine, potassium, phosphorous, riboflavin and vitamin B. Vitamin B12 in yoghurt maintains your red blood cells and keeps your nervous system functioning properly. Also, the potassium in yoghurt rebalances excessive sodium in your body that causes hypertension. Rich in calcium – To prevent or treat osteoporosis, you need sufficient digestible calcium. An 8-ounce serving of yoghurt gives you 450mg, that’s approximately 30% to 40% of the adult RDA for calcium. Because the live-active cultures in yoghurt increase the absorption of calcium, an 8-ounce serving of yoghurt gets more calcium into your body than the same volume of milk can! Easier to digest than milk – Great news if can’t stomach milk! Yoghurt is much easier on your tummy because it contains lactase, the digestive enzyme that’s lacking in those who are lactose intolerant. High protein food – Plain yoghurt contains 10g to 14g of protein per 8-ounce, which amounts to 20% of your daily protein requirement. In fact, 8 ounces of yoghurt has 20% more protein than the same volume in milk. Also, during the culturing process in making yoghurt, the protein becomes easier to digest. Growth food – Yoghurt can help children with intestinal absorption problems. Pre-digested protein and the lactic acid in yoghurt increase the absorption of minerals, spurring a healthy and balanced growth for your child. You’d think the amount of calcium would be the same in all yoghurt, but that’s not so. How much calcium ends up in a tub depends on the processing. Fruit yoghurt tends to have less calcium because the sugar and fruit take up precious space in the container. Also, some yoghurt manufacturers have a post-pasteurization process. This kills off all bacteria, both friendly or unfriendly. Homemade yoghurt is the only sure way you can retain all the goodness of yoghurt. You can make it from any type of milk and add in your own natural flavours and toppings. The health benefits of yoghurt increase when you eat it fresh and while it’s still bursting with friendly lactic acid bacteria.